Here are additional materials and activities I have created for teaching Deutsche Welle’s Top-Thema module entitled: “Lebensmittel im Müll“. The original Deutsche Welle materials can be accessed from the theme webpage, or the text and exercises (pdf) and audio (mp3) can be downloaded for offline use. Students work with words from the text using the context of the article itself. But they may not refer to the original article. If students have read closely and repeatedly, the language should be familiar to them. If it is not familiar, then this is a clue that they should be reading more intensively at home when the text is assigned. Remember, this is not the first time they are seeing the text. They hopefully have read it while listening to the audio that goes with it, read it again out loud and again silently, and they have read it in an attempt to answer the Fragen zum Text. If you find students need more time with the text to become more familiar with it before doing the cloze activity, they could first work with the text in other ways. Further questions for discussion alternates between having students identify the facts described in the article and having them comment on their own experiences and offer their own ideas. The Deutsche Welle articles are an excellent resource for drawing students’ attention to language patterns. One particular sentence in this article gave me the inspiration for this activity. of having students practice using je … desto. Je mehr Essen verschwendet wird, desto höher liegen die weltweiten Lebensmittelpreise. Before doing the activity, students deconstruct the sentence with assistance. They notice that a comparative (mehr and höher) follows both je and desto. The also notice the je-clause has dependent word order with its main verb at the end of the clause (wird), while the desto-clause has its main verb directly following its comparative. Then students work in groups to complete each sentence with their own ideas. After doing this, they may be able to create some je … desto statements that are entirely their own. This activity deviates away from the content of the article after the first two sentences, but I think it’s perfectly fine to change things up on a regular basis. In this case the article simply provides a springboard for a different language practice activity. This activity is only loosely related to the article as well, but I like giving students the chance to have fun with the language. I am a big fan of language games, which you will surely notice if you spend any time on this website. Games motivate students to interact in a way that moves language learning into the background. In other words, the game becomes the students’ primary focus and, though they are using German to play the game, they almost forget that they are there to practice and learn the language. If you’ve ever played 20 Questions, then you basically know how the game works. I made a set of flash cards with names of food items on them. I have students break into smaller groups (4 students max) and play their own separate games. Students get more language practice in small groups than if we played as whole class. A student in each group chooses a card and keeps it secret from the others. The other players take turns asking ja-nein questions. Isst man das zum Frühstück? Kann man es trinken? Kocht man es normalerweise, bevor man es isst? Ist es eine Obstsorte? The player holding the card must answer each questions with ja or nein. If students cannot guess what’s on the card in 20 questions or less, the person holding the card wins. Because they already know that the category is Lebensmittel, they have a narrower field for asking questions and guessing. You might want to play a round as a whole class with you (or a student) as the cardholder for the first round to make sure everybody understands how the game is supposed to progress. 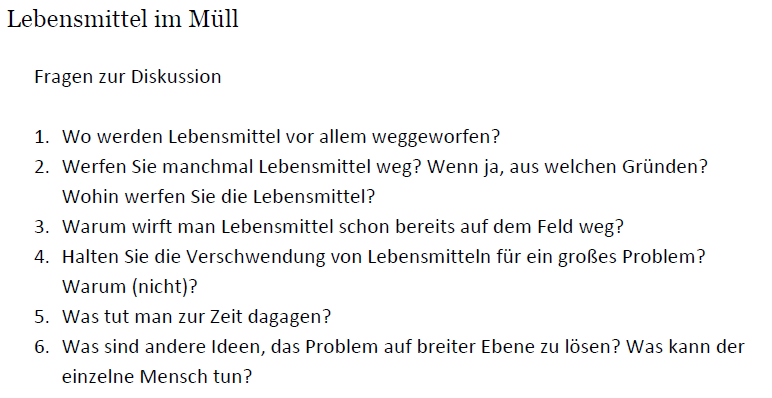 Here are the downloads for “Lebensmittel im Müll.” All activities except the 20 questions game are in the Weitere Übungen pdf-download. in a single pdf-file. 20 Questions cards are in their own separate pdf-file. 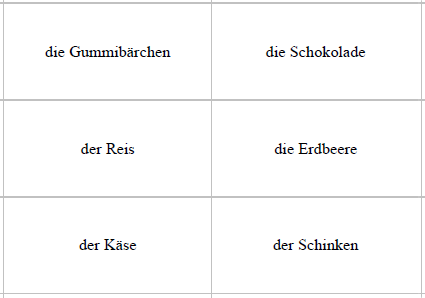 There are two pages worth of Lebensmittel cards, for a total of 48 different cards. You should use a heavier paper and/or colored paper to print the cards on, both for durability and to prevent players from being able to see through the paper. I have left a third template page blank in case you’d like to add cards of your own. Just print the page, cut on the gray lines and write your own Lebensmittel words on the cards. And the original Deutsche Welle Top-Thema page in HTML, with audio and comprehension exercises, is here: “Lebensmittel im Müll“.